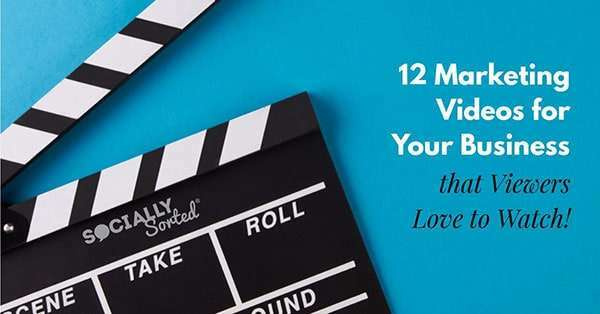 In this post you’ll discover 12 types of marketing videos that viewers love to watch. If you’re thinking of creating marketing videos for your business then these ideas will get you started. We’ll then take a look of some of our favourite video types from the list and how you can use them – with examples and tips for better results. Video a huge part of any customer journey from awareness to becoming a customer then a raving advocate and repeat customer. But not all types of marketing videos are perfect for every business. I was therefore glad to see that Vidyard produced an awesome infographic breaking down the different types of marketing videos you can create – and what might suit each business. We’ve shared it below. Vidyard’s infographic is designed to highlight the different video types for a B2B (Business to Business) Customer and how each type of video can impact the customer journey. However, I believe many of these marketing videos are equally suited to B2C Customers (business to customer) marketing videos too, so it’s relevant to all of us. With each of these video types you’ll need to consider a number of factors depending on where your business is at, the complexity of the video project and your budget. Different videos require different budgets, production value, length and distribution to get the best results. See the infographic and blog post at Vidyard here. Now that you’ve had the infographic to play with (don’t forget to share it later to Pinterest! ), let’s dive into some examples of my favourite video types! Remember, these videos can work for B2B businesses as well as B2C – you just have to find the right kind of video, budget and production-type for you. Let’s start with one of the most popular marketing videos you’ll see on social media and YouTube, How-To Videos. I love How-to videos because they come in all shapes and sizes. 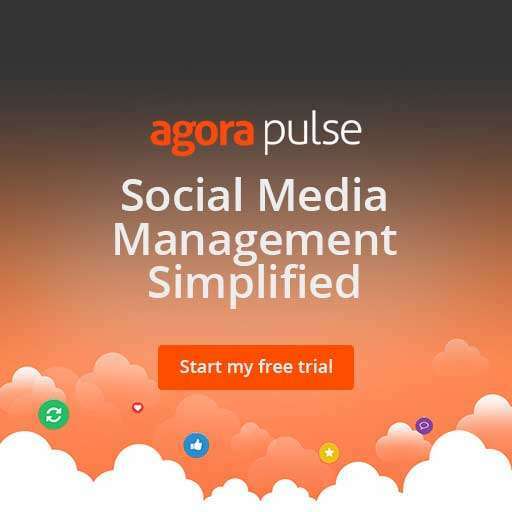 You can even do short marketing videos of just a few seconds. Your marketing videos don’t even have to have an intro or outro if you are simply posting it to Facebook or Instagram in this format. Screencasts are a great way to create content quickly. And check out this next video from Cooker and a Looker on Facebook. Amanda decided to try a hack she had seen online – how to husk corn the easy way! And can I just say.. what the? Why did we not know this already? Hot Tip: Anything can be content, so have your camera ready in case something is interesting enough to capture as a how-to or hack! When an explainer video is done badly it can be very very hard to watch. But when it is done well, it can be brilliant. This is perhaps one of my favourites ever, because it manages to do a great job of explaining something that is pretty hard to explain: the Blockchain. AdBank is a platform that uses the Blockchain to stop Ad Fraud. Just watch it, even if you don’t have any interest in crypto-stuff and the Blockchain. It’s really well done. Any explainer video that entertains while explaining is a winner, in my book. Keep your video simple and easy to understand and don’t try to cramp too much content in – you want people to go away with understanding, not confusion. Focus on the problem your business is addressing, what your solution is (and how it works) and then give a clear call to action. Another of my favourites is from the team at Slack. It’s a brilliant example of an entertaining explainer video (or Product Demo video – see these below… sometimes they overlap!). Notice how it’s not Google telling the story? It’s the users telling the story. This is a great strategy to use if you are creating a promo video. Capture your users, and customers telling YOUR story (or their story as it pertains to your story). It’s a powerful testimonial and works very effectively as a promotional or awareness video. A promotional video doesn’t have to be high-end. 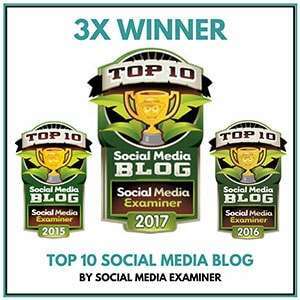 You can create them for social media to post on Facebook or Instagram….Like this simple video showing one of the best features of a Koala mattress! Your wine won’t spill (and you won’t wake up your partner when you roll over either!). The company “Monday” has created a great example of a Product Demo Video. Monday is a productivity tool a bit like Trello or Asana or Basecamp. I love the marketing videos produced by Monday. They are so much fun I almost want to jump ship from my existing tool, and use them. I have been known to watch their ads to the end before YouTube videos start – they are that good. Well it would be rude of me not to feature Rand Fishkin here with his Whiteboard Friday videos. He breaks down a boring topic and makes it interesting, practical and useful so you always walk away learning something. He uses a whiteboard but really it’s just a matter of drawing or writing your message on any medium – whatever helps us learn! The key is not to rely on it! Rand still presents face-to-camera, breaking his knowledge down so we can easily apply it. Hot Tip – you don’t need to fill the screen with words, like Rand does. He gets away with it as he is engaging and uses the text as a back up while he presents face-to-camera. So really, you are watching Rand, and then the words are cues or reminders + takeaways. whether it’s drawing or writing, visual content like this can be a great way to bring your point home. I like what the team at Vidyard have done with their “Meet the Team” Videos. It doesn’t need huge production but it can be very powerful for your audience to see who they are working with. Simple face-to-camera with maybe an intro and outro is fine. Or why not do things a little differently and ask unusual questions or show bloopers. The more you can show the personality of your team, the more your audience and potential customers will relate to you! Personally, I like quirky videos. So, to me, the best company culture videos are never going to be about your team standing up and talking about the values of the company. Yes you can capture video of you at charitable events or behind the scenes.. and all those “company fun” things. Or you can do something different like Basecamp does in this video. They did a blind coffee tasting! It shows the fun side of the team, their bad jokes and humour and their coffee… um… prowess. OK we’ll forgive them for the coffee (I’m an espresso-drinking coffee snob) but nonetheless, it’s a great video. Speaking of video, here’s another great example of showing your company culture or team. A little while back the team at J29 Creative captured some video of me on stage at Social Media Marketing World 2018. I was speaking in a large room with 700 people, so I asked them to capture some panning shots of me and the audience. 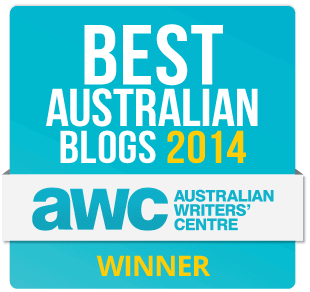 To thank them for taking the footage, I sent them some chocolate treats from Australia, including Tim Tams. Now, if you’re Australian, you’ll know about Tim Tams and doing the Tim Tam Slam. It’s fun and super delicious. If you don’t know what it is, watch the guys at J29 Creative work it out with my help (I sent them the instructions). Come on, admit it, you want one now too, don’t you? This video introduces us to some of the J29 Creative team in a fun way. I love how they took an unexpected gift and turned it into a great video opportunity. Sure, they are talented videographers, but anyone can capture a Tim Tam Slam on a smart phone. The key thing here is that they bothered to film it! Note: and I do realise that both of these examples contain coffee. I want to finish with this one, because I think of all the videos above, it can be the most powerful of all. As you will see on the infographic above, it’s suited to any part of the sales funnel. 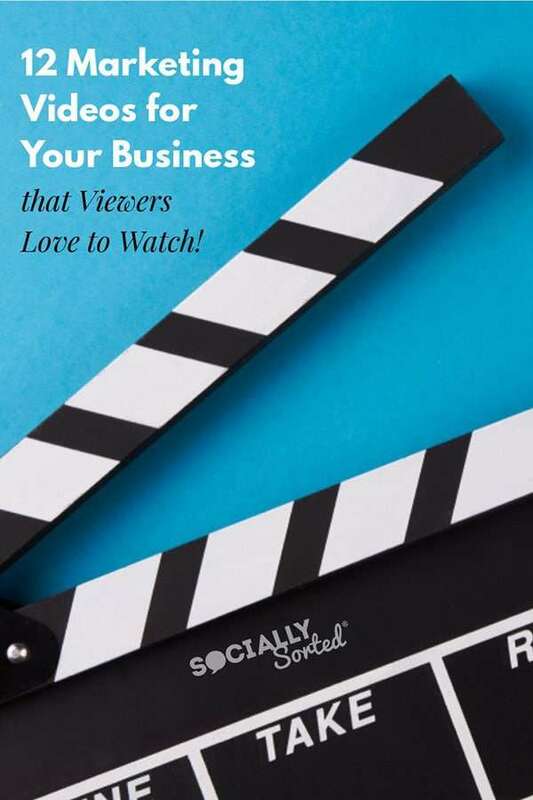 A personal video can be created so easily these days – whether it’s your CEO or one of your team… even a solo business owner. It’s personal and it makes an impression. Have you ever received a personal video that you haven’t responded to? I know I haven’t! I’ll always take the time to respond. The person took the effort to message me with video, why wouldn’t I? The link stays live and you can watch it anytime. His audience loves receiving the personal welcome. If your customer is spending decent money on your business, don’t you think this is a great way to leave another good impression on them? It sure did with me! You could also use a tool like Loom which records unlimited short videos with links for free. Bonjoro is tailored for big groups of people that you want to thank. Either way, as long as the tool gives you a personal link to send via email or social media, you’re good to go! Phew that’s a few video options for you! Remember, you don’t have to use them all at once. Take some time to work out the right kind of marketing videos for your business, then try just one! It might take a bit of experimentation to work out the best medium for you, but at least you now have lots of options! And don’t forget to include the simple things like personal videos! Sometimes we can get so wrapped up in trying to make our content super professional (and especially so with video) that we forget to connect with people. Personalised video is one of the BEST ways to do that! Wave.Video – you can create over 30 different sized videos with millions of video stock clips to choose from as well as text and photos. Great for social videos. Loom Screencasting tool – I use this to capture quick screencasts when I don’t have a lot of time to use a bigger tool. Then just share the link! 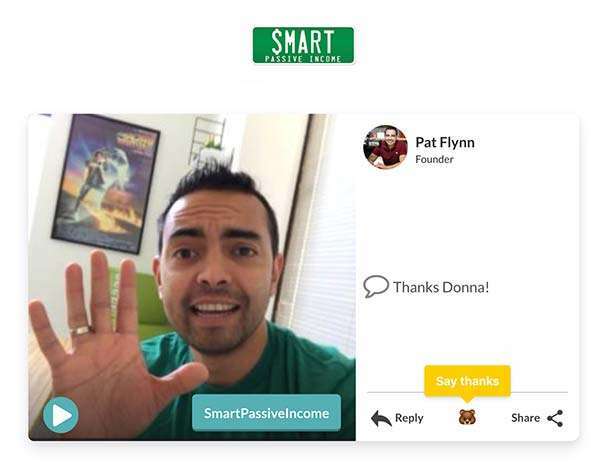 Bonjor Customer Onboarding Video tool – great for personalising your customer onboarding like Pat Flynn did, above. Demio is my current favourite webinar tool as it automatically records and you can use the content for other purposes or send it as a replay. Your Camera! Have it handy to capture content that you may be able to use later! What kind of marketing videos are you creating? Any from this list?